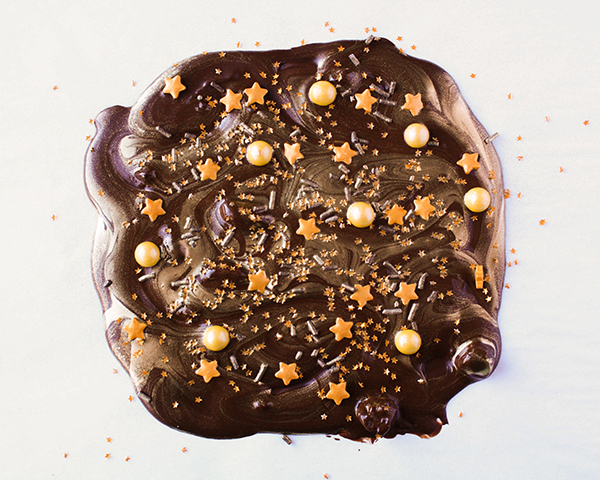 How to make a drippy chocolate cake, with perfect drizzles of ganache, purposefully placed candy pieces and shards of chocolate. A cake decorating tutorial by our contributor, Erin Gardner of Erin Bakes. 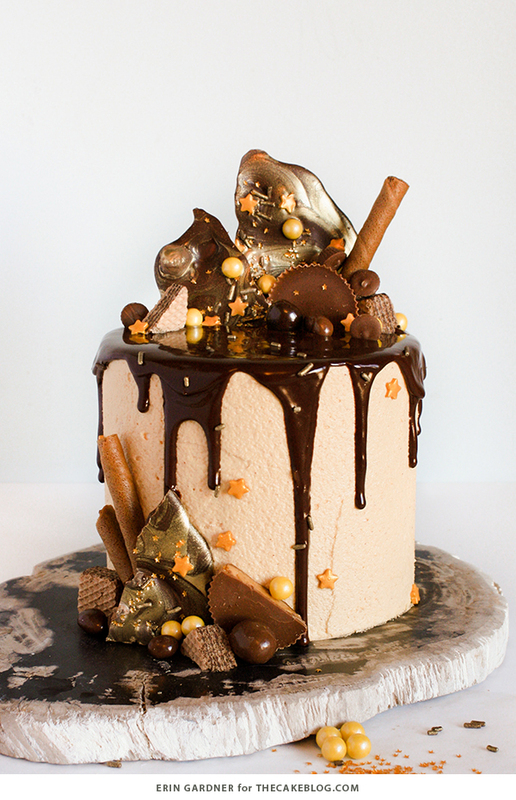 Aussie cake designers like Katherine Sabbath, Unbirthday Bakery, and Cakes by Cliff (to name a few) have taken the cake design world by storm with their fun new twists on the classic chocolate drip cake. When these cakes first started popping up in my newsfeed, I was immediately obsessed. Lush buttercream, glossy chocolate ganache, a more-is-more attitude, and candy – LOTS of candy! What’s not to love? I love how easy it is to put your own spin on this kind of cake, but successfully executing a purposefully-deconstructed design can be tricky. Here are a few tips on how to create your own messy masterpiece without making a drippy mess. 1. Start with a delicious cake recipe, a silky-smooth buttercream finish, and a firm-setting chocolate ganache. I used this chocolate peanut butter cake recipe. 2. 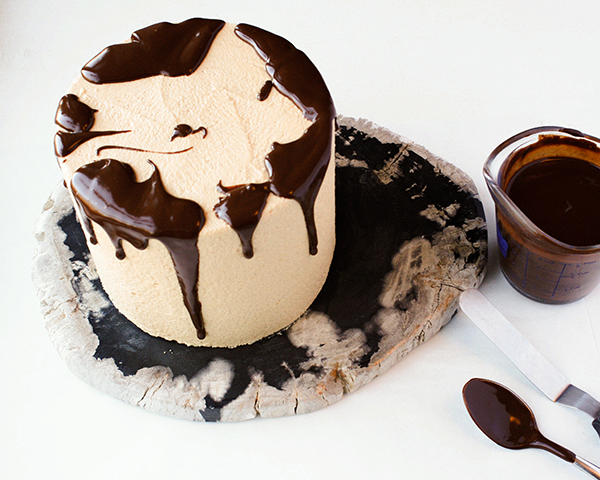 Make sure your cake is thoroughly chilled before applying your drippy ganache and work with confidence! Use a spoon to first add a few purposeful drips over the top edge of the cake. 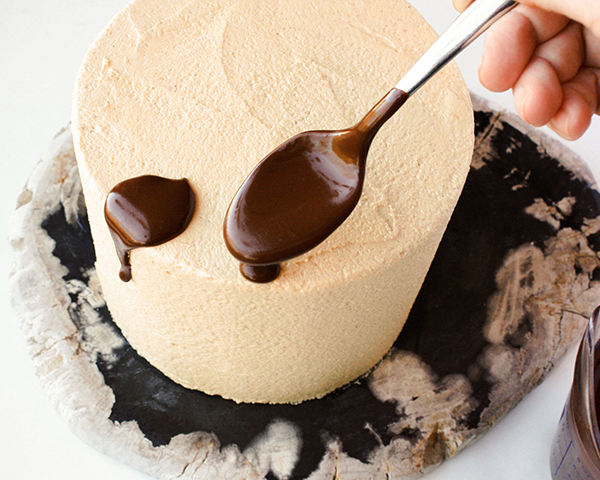 Next, pour more ganache on the top of the cake, pushing it just to the edge with a small offset spatula. 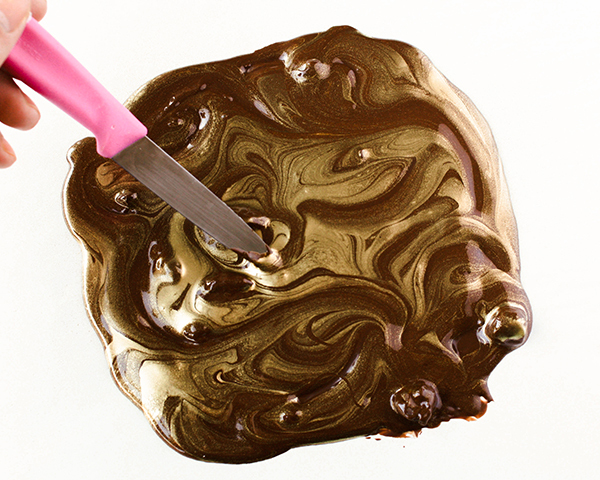 Gently tap your cake stand against the surface of your table to smooth out any lines left behind by the spatula and so that a little bit more of the ganache spills over onto the sides of the cake. 3. Pick your palette. For my cake I chose to stick with colors, textures, and candy related to the flavors and colors already occurring in my cake – chocolate and peanut butter. 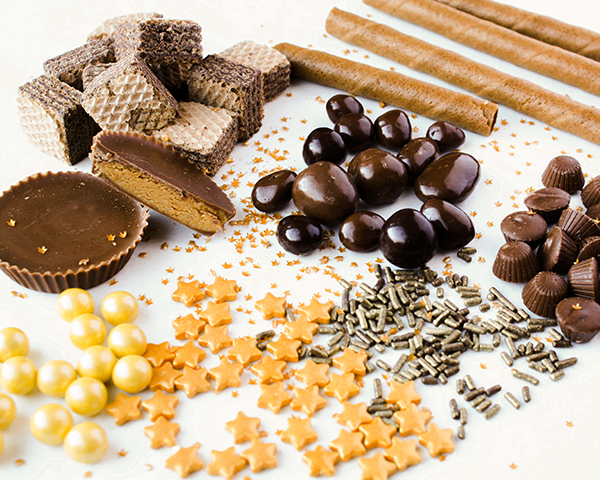 Some of the items I chose included peanut butter cups of varying sizes, chocolate pirouette cookies, wafer cookies, chocolate coated nuts, shimmery yellow sixlets, star candies and teeny tiny edible gold stars. 4. Add some height! One of the signature elements of this style of cake is a tall element backing the rest of the design. Some use chocolate shards or chocolate “sails” to anchor their deconstructed displays. I created mine by pouring some melted chocolate onto a piece of parchment paper. 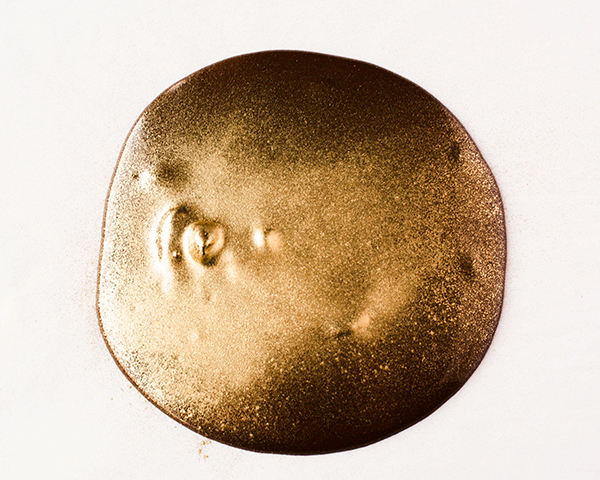 I dusted on a little edible gold luster dust and swirled it in using the tip of a small knife before scattering on edible gold stars, sprinkles, and sixlets. Once the chocolate was set, I broke it apart into large chunks and used a few pieces on the top and one on the side of the cake. 5. Fill in your design with the rest of your cookies, candy, and other sweets. Start with larger pieces and finish by adding the smaller elements. Try to work with odd numbers and to place things asymmetrically. You can add as much or as little embellishment as your want. In keeping with the spirit of this style, I went for it! Love this post, Erin! Just shared it on my Page. 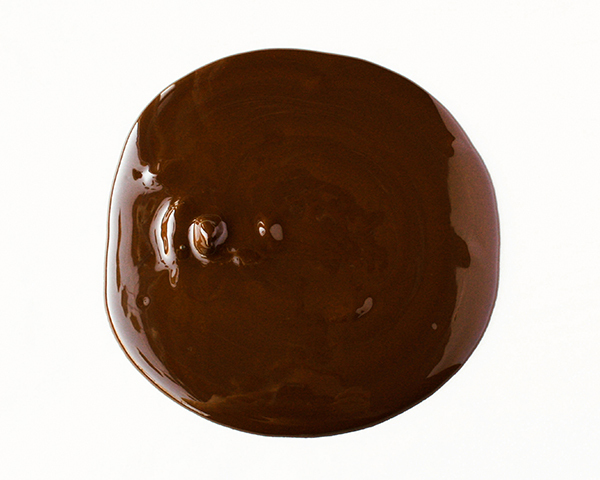 Would you mind telling me if you use a standard 2:1 dark chocolate to cream ratio for your ganache drizzle? This seems so hard to get right. I’ve never tried, but am about to! Thank you! The gold makes it! Love this cake! Any advice on what to do if we want to do a colored drip? Thanks! This is just a chocolate peanut butter heaven!! 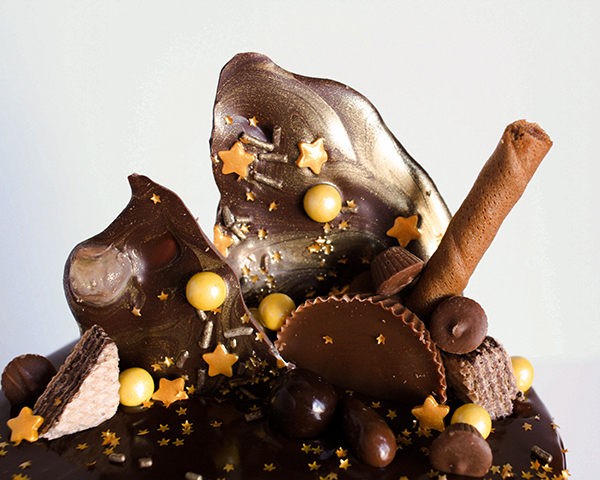 Love the golden effect on the chocolate, very clever! Wow this looks amazing – and so delicious too! I mad is last night for my birthday party. It was gorgeous and quite yummy. I used a variety of things I had on hand to use in the chocolate hard toppings. It inspires me to try more. The drippy part was a blast. Sorry for the typo…made not mad. Glad you gave this cake a try Rebecca! Thanks for the feedback! Thank u so much for this wonderful post. The gold designs made it look even yummier and elegant. It’s a perfect gift for a loved one. I will definitely give this a try for my hubby. Hi very elegant cake . Love it so much! May I know how many inches is the cake pictured above? Thanks. This cake is a 6″ round. 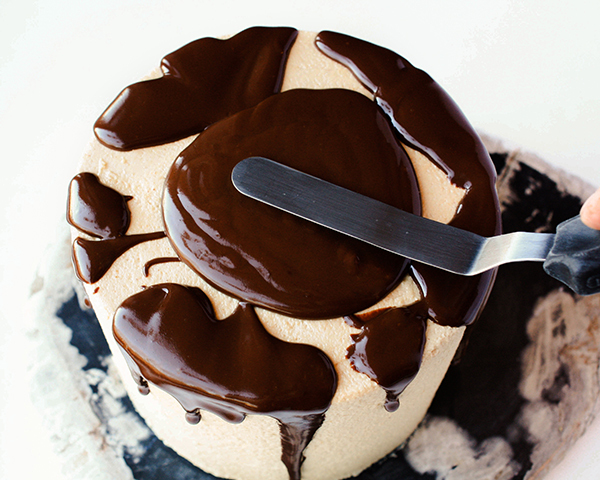 The chocolate and peanut butter cake recipe used was written as an 8″ round. Hope that helps! I made this today for a dessert auction. When I placed it on the table, people were in disbelief!!! Thanks for the great blog and photos!! This cake looks incredible! I’m making a cake for a 30th birthday and thought this would be a fantastic showstopper. Unfortunalty, she’s not a fan of peanut butter! 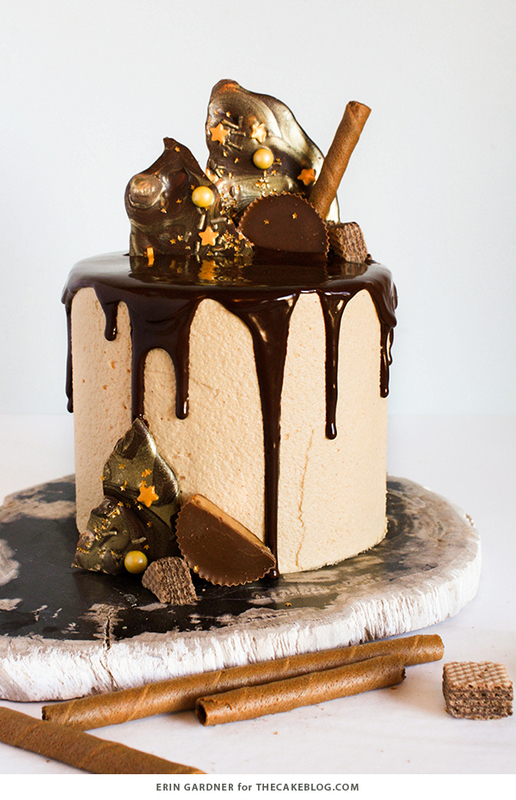 Is there a chocolate or even a caramel buttercream recipe I could use instead of the peanut butter one but will give just as nice finish? Sure Verity – we’ve added links to some of our other drip cake recipes at the end of this post. Hopefully one of those will work better for you! If your cake is completely covered in buttercream, you should be fine. Buttercream helps lock in the moisture and protect the cake inside. Just keep it in the fridge and add the finishing touches when ready. Enjoy! Where can I find the metallic tubed-looking sprinkles or did you make those? In between the candy stars and the miniature peanut butter cups? Hi Rose – those are gold jimmie sprinkles. You can find them in your local craft store or cake supply store. Or you can purchase something similar online here, but we haven’t personally tried this particular brand. Hope that gets you going in the right direction! 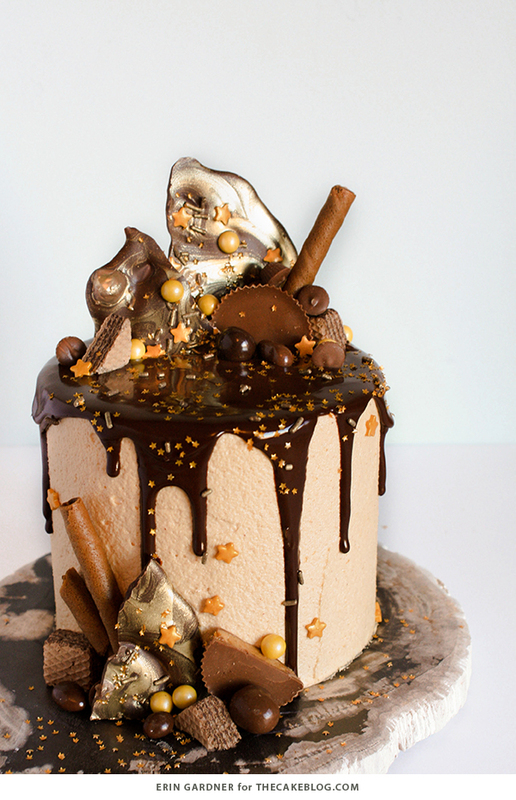 Hi, the gold chocolate looks fabulous and I really need to make it! I was wondering if the chocolate needs to be tempered first? Pepperidge Farm makes a chocolate fudge pirouette! Can I coat the cake with whipped ganash instead of buttercream? Not a fan buttercream usually. That would work just fine! i lurrvve this cake! can you tell me how many layers the cake is?? 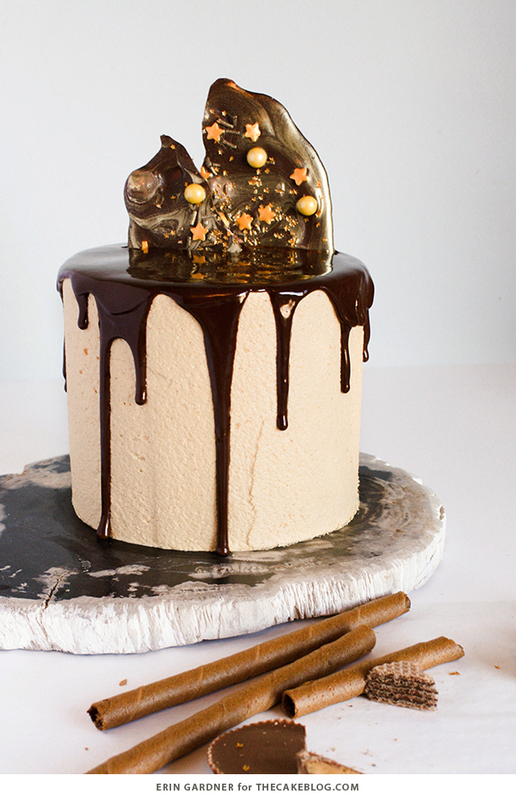 Hi can you make this drip cake the night before the party…and place it in the fridge ? Yes, it will store in the refrigerator just fine. Enjoy! Will a drip cake travel well? I need to deliver it about 2 hrs away and was wondering if I would have trouble with the drips melting or anything? Also- for a 2 or 3 tier cake do you do the drips after stacking the cakes or before? Have you tried it yet ? Did it travel because I have the same question? As long as your cake is chilled, the drips will stay put without any issues. They set up much like frosting once refrigerated. If I make colorful drips a couple days before I serve the cake… will they bleed or do anything wierd? I’ve successfully make regular chocolate dripped cakes several days in advance. And this colorful drip cake was good for several days as well, but it was a fruit based drip. If you’re concerned about your specific recipe, a test run never hurts! this was a fun cake to make…. thanks for sharing your designs with us all. Hi! I think this May have been slightly covered in previous comments just want to confirm that nothing wonky will happen if drip is added and then placed in fridge. Drip shouldn’t change color or anything right? Well, I liked the way you decorated the cake!